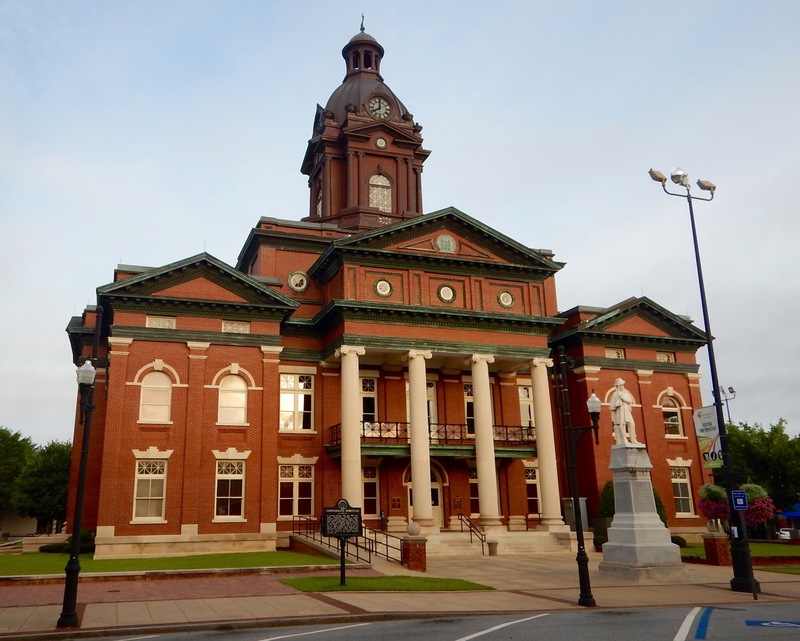 Have you been to Newnan lately? The “City of Homes” has spent a lot of money on its square, starting with the beautifully refurbished Coweta County Courthouse. 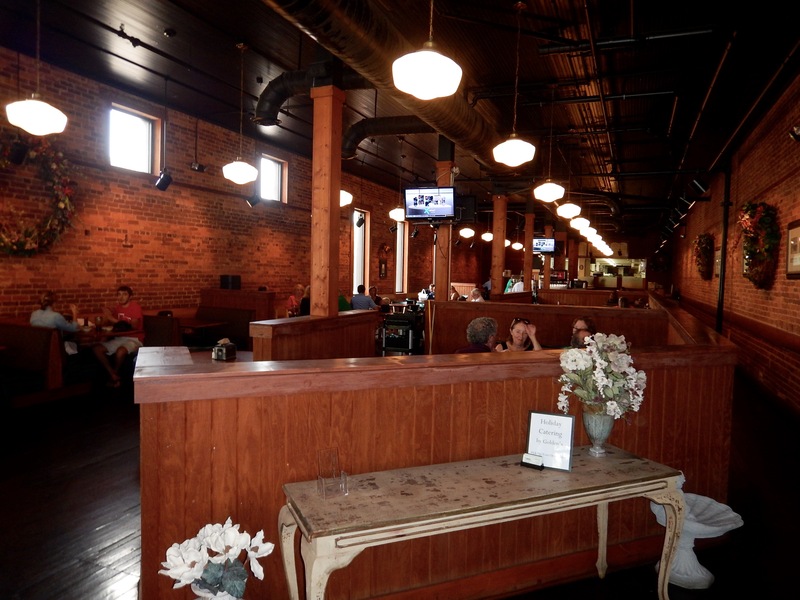 A few newer restaurants have sprung up in the square, including a pizza place, Mexican, and the Redneck Gourmet. 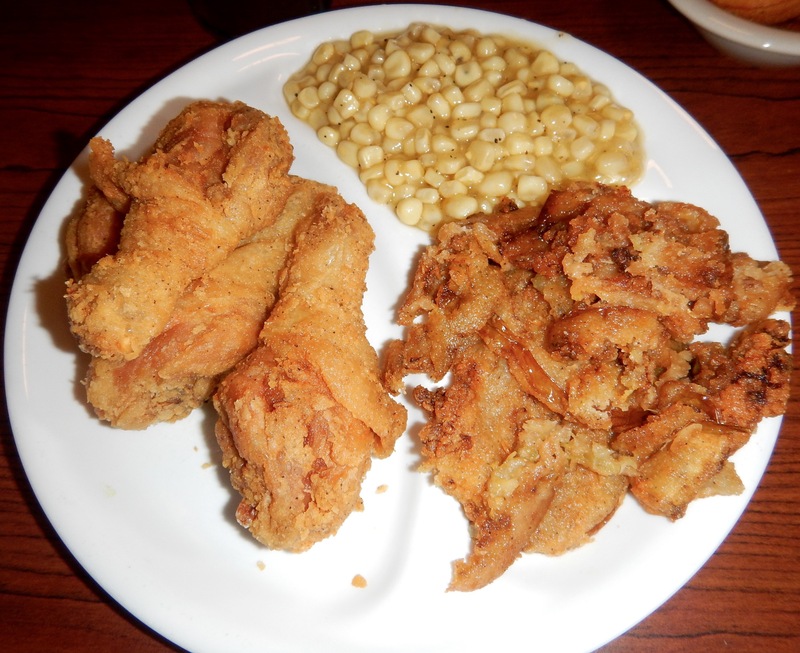 It’s not a dining destination like the Decatur or Marietta squares, partly because (like most small towns in Georgia) most of the restaurants are closed on Sundays. 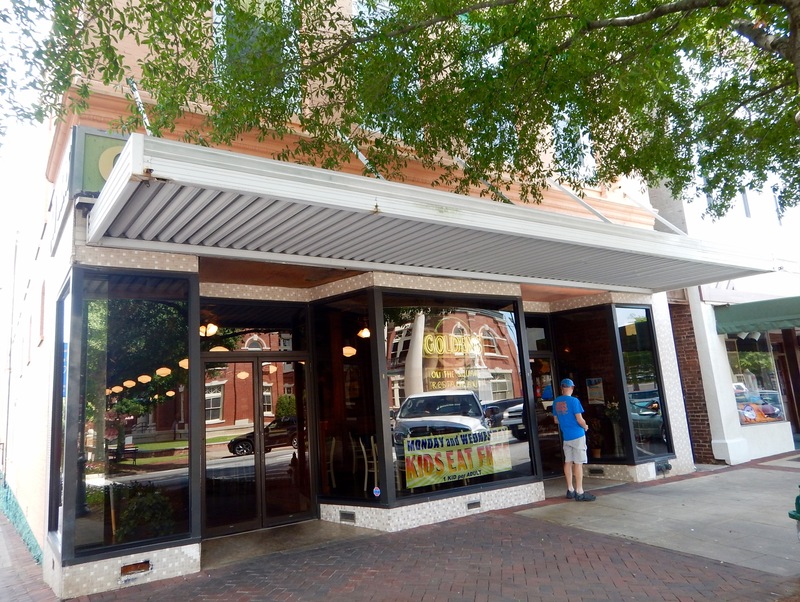 The granddaddy of Newnan restaurants (since 1972!) is Goldens On The Square and they happen to be open on Sundays. When the sign is lit, they are open. Let’s get in line and see what’s on the menu. The old brick from the building is a nice touch. After church gets out on Sundays, the line goes from the wall on the right all the way to the entrance. The menu is meat and two, or meat and three if you are hungry. You make your choices as you walk through a cafeteria-style line and the ladies put it on your plate. A good blogger would have a picture of the cafeteria line here, but nobody said we are good bloggers! It’s reasonably priced and the two of us ate for under $20, including drinks and a dessert for me. Choices include meat loaf, catfish and chicken. 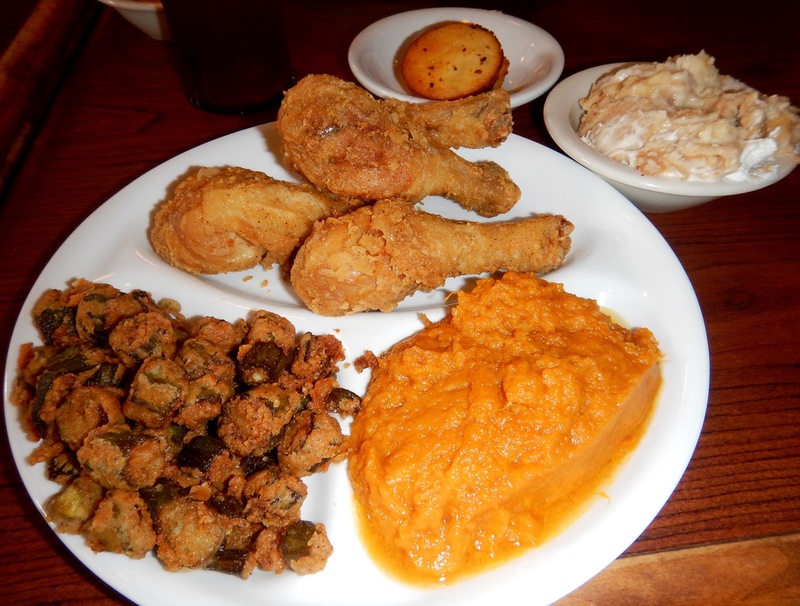 The fried chicken is the star of our plates. Eve gets fried green tomatoes and corn with hers. The corn is probably from a can, but it’s not overcooked and nicely seasoned. It’s the “side of the day” for us. The tomatoes are very soft and greasy and barely look like tomatoes. Before we look at my plate, here’s a tip: if you choose the white meat with the chicken, they give you one chicken breast. If you get the dark meat, they give you four chicken legs. That makes it a pretty easy choice. The chicken is good. It’s crunchy on the outside and moist on the inside. Four drumsticks are a lot, and even though we have just finished a 43-mile bike ride, and we each give one away to friends. Goldens puts the “sweet” in sweet potatoes. My yams are too sweet and the okra is pretty greasy. The corn muffin is dry and not anything special, but beats the other choice, a white-bread roll. I can’t resist banana pudding, which I get for dessert. It’s full of ‘nana and ‘nilla wafers and could be the best thing I eat at Goldens on this Sunday afternoon. The bottom line on Goldens On The Square: It’s where the church crowd goes on Sundays. If you have a fix for a classic meat and two/three and your diet needs more grease, this could be the place for you. 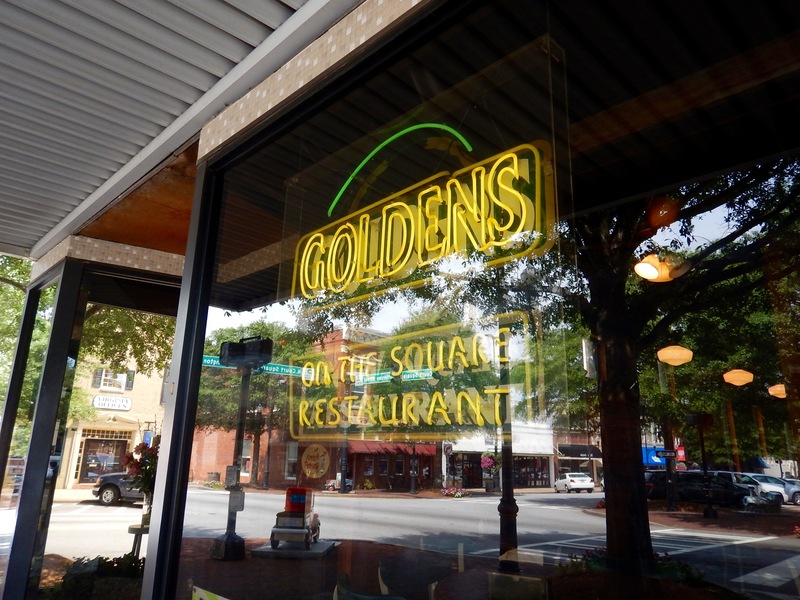 There are at least three closed restaurants on the square during our Sunday visit, and if their owners know what kind of business Goldens does, you wonder why they stay closed on Sundays.